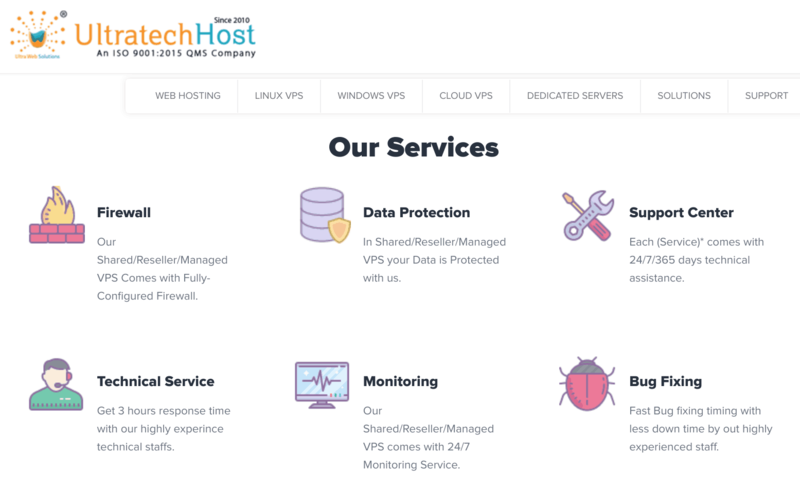 UltratechHost Review 2019: Is UltratechHost a Good Hosting? UltratechHost is an Indian website host with an international presence. They have a network of servers located around the world, and they provide 24/7 technical support. Founded in 2010, UltratechHost is an India-based website hosting provider. They currently have more than 700 servers – in the Netherlands, Germany, the U.S., and Russia – and they boast a 99.98% uptime record. Their website is in English. UltratechHost has servers located in multiple worldwide locations, but the shared hosting plans are only available on the Netherlands server. They have a 99.9% uptime record (not backed by SLA), they use SSD storage for faster read/write speeds, and they provide the popular cPanel control panel. The Bronze, Silver, Gold, and Platinum shared hosting plans all use the Linux operating system. Resource levels are 20 GB, 60 GB, 100 GB, and 200 GB SSD storage respectively, and 100 GB, 600 GB, 1000 GB, and unlimited bandwidth respectively. As well as very substantial resources, they also offer unlimited MySQL databases and email accounts. There is good support for programming languages and tools such as CGI, FastCGI, PHP, Perl, Python, Ruby on Rails, and cURL. For less experienced website owners, they offer the free Softaculous one-click installer (for more than 200 programs) and a pay-for website building tool. Automatic daily and weekly backups are taken to off-site server location for data security, and all plans come as standard with CloudFlare CDN. UltratechHost’s prices are quite expensive when compared to both local and international providers. But these premium price points are justified by the feature-packed packages. In fact, even the affordable base plan comes with 20 GB SSD storage and 100 GB monthly bandwidth, which is much more than most everyday website owners will need. Hosting plans can be bought on one, three, six or twelve-month terms, and the prices are deeply discounted for longer upfront commitments. At the checkout, you can select optional add-ons including additional IP addresses, extra HDD storage, Weebly website builder, domain registration, and SpamExperts email security. Let’s Encrypt SSL certificates are included for free with all plans. Not only does UltratechHost offer a 15-day money-back guarantee, but also you can downgrade at any time (which is unusual). Pre-sales and billing support is available during working hours on weekdays via phone, email, and live chat. Technical support is available 24/7/365 via email, support ticket, and live chat. Their website also has a detailed knowledge base and FAQ section. Not only is their support provision substantial; it’s also very efficient and helpful. Since launching in 2010, UltratechHost has grown from strength to strength by adding dedicated servers in 2012 then adding shared hosting and reseller hosting in 2014. They enjoy a 95% customer satisfaction rating, so all those happy customers surely can’t be wrong. Check out UltratechHost’s web hosting options today! Wondering how UltratechHost stacks up against other Web Hosting companies? Enter any other Web Hosting company and we will give you a side-by-side comparison.